and of course the you-can-never-get-tired-of-it stupendous scenery of the Rocky Mountains all weekend. If you were at Barebones 2012, please fill out our survey. Both local papers put Barebones orienteering on their front page this week! Cover features this great photo of Alaric Fish & his daughter Nadia. Cover features a photo of John Rance of Vancouver. 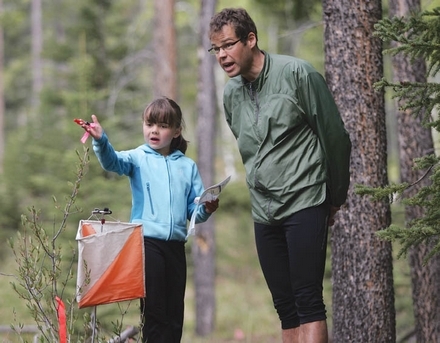 Nadia Fish has a serious discussion with dad, Alaric, during Saturday morning’s (May 26) Barebones orienteering event at the Canmore Nordic Centre. You can see some photos from Barebones 2012 at OrienteerApp. If you have photos too, and a Flickr account, then simply load your shots to Flickr and tag them with "orienteerapp856" and they will automagically appear. If you have photos but no Flickr account, then please send me a link and I'll put it here. The danger with making such a list is that you leave someone off. This space is dedicated to all those volunteers that I can't think of right now! The Barebones races are ideal for all ages to try orienteering. We have courses for all ages and levels of fitness. We've got clinics. And we've got lots really enjoyable forest to run through. To make the event a bit easier to understand for beginners, we've made a web page without the jargon and without all the confusing details you might find on this page - click here to see beginner-friendly information. May 24th Race info added to the myO 'Barebones 2012' page. Check it out on your mobile device. Tres chic. May 24th Added a News page with copies of recent email updates. May 21st Added course lengths & climb to Course & Category table. May 21st Added a new web page with beginner-friendly information. May 12th Added information about Safety. PLEASE READ IT!! May 12th IMPORTANT: We have moved some categories to different courses. In the process AZ in an incredible bit of bad luck (or bad judgment) managed to lose track of the category you registered for!! Sorry!!! Please view the list of runners and check you are in the category you want. Contact Jean (jean@barebones.ca) right away for any changes. April 28th Update to Technical Difficulty chart. Note that some categories have moved slightly. Please double check you are registered for the course you would like, and let us know if you would like any changes. Also note Super Novice & Novice are combined. March 30th Added "Super Sprint" to the program. A fundraiser organized by the FWOC Junior team, to support their travel to orienteering races. March 21st All venues approved (or at least tentatively approved). Canada Cup sanctioning submitted for Centre-to-Centre Sprint. Special Guest Course Planner recruited from over 5,000km away!! 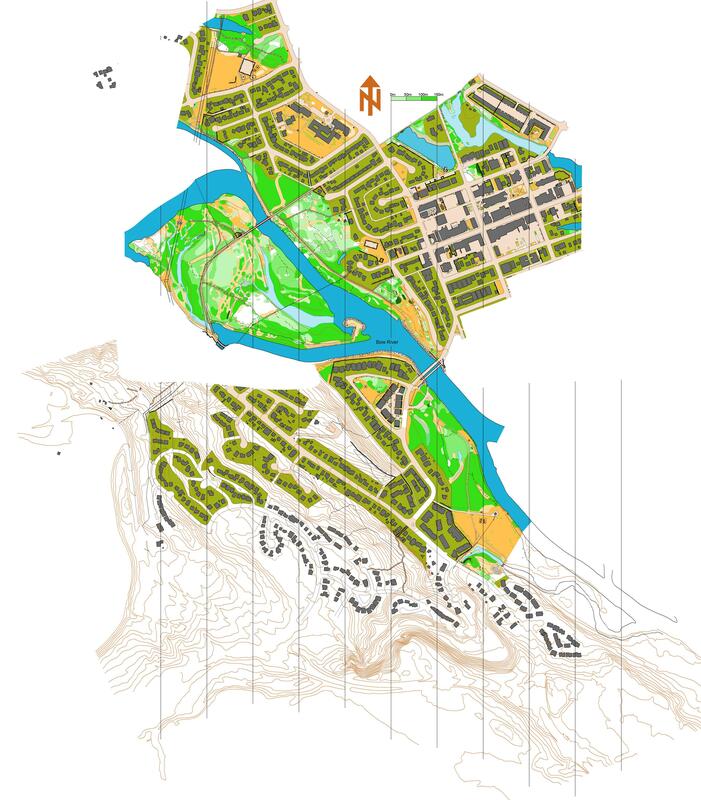 Mapper lined up to update Canmore map(s) - just need the snow to melt! Schedule is subject to change, as always. The Canadian Junior team coach, Brent Langbakk, has offered to set a number of ribbons on the Rafter Six orienteering map for those interested in some technical training on Friday afternoon. If you want to do this activity, please email Adrian. You will get a map showing the control locations, but there is no other support. We recommend going in a group for safety reasons. Former national team member Charlotte MacNaughton is offering a free one-hour clinic at 7:00pm on Friday evening. She will cover the basic aspects of orienteering, including reading the map, holding the map (surprisingly useful tips), basic strategy and navigation, and the logistics of the Barebones weekend. Click here for more information, and feel free to email Adrian with any questions at all about the Barebones weekend or orienteering in general. Starting at the Canmore Nordic Centre, this will be a downhill sprint through the complex ski trails, down the hill, across the river, and into the Town of Canmore for the finish. A really fun mix of terrain types - from open forest, to complex trails, to urban. Heading west from the Day Lodge orienteers will be challenged by a variety of terrain, long route choices, and of course a little bit of climb. The ultimate test of orienteering toughness. 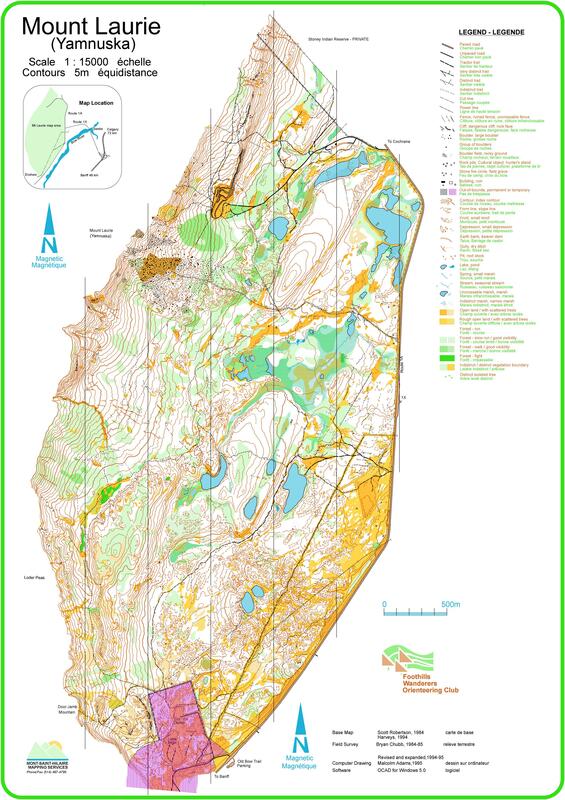 Barebones 2012 finishes on one of the world's most fantastic orienteering maps. Glorious views, incredible contour detail, and fabulous open running combine to make this a true test of technical navigation at high speed. A race that will bring a smile to your face! This will be a Middle distance race, meaning that it will push your navigation and map reading to the max. The FWOC Juniors are organizing a bonus race - the cherry on the top of the Barebones weekend. The Super Sprint will have bazillions of controls in a 500m forest sprint! All proceeds from this race go directly to the Juniors to support travel to orienteering events. All races are taking part on existing maps. Check out the 2008 Middle distance race on Mt Laurie. At each race during Barebones there will be a Kids' Fun Zone activity in the finish arena. In the Sprint arena at Lion's Park there will be a play-ground O score event. At the Nordic Centre arena for the Long distance race there will be a labyrinth that will challenge even the adults. And following the Middle at Mt Laurie the FWOC Junior Development kids will be hosting an Ultra Sprint - billions of controls in 400-500m of orienteering. Sprint (Saturday AM, Canmore Nordic Centre): The nature of a sprint race is high speed with continuous concentration and decision making. Races are short (winning time 12-15 minutes) and navigation is relatively easy. Middle (Sunday, Mt Laurie): Middle distance races are technically demanding, with the emphasis on good map reading and terrain interpretation. Winning times are around 25-35 minutes. This race is a Canada Cup race, and so will use age categories. We encourage you to register in you age category, or in the Elite (M21E / W21E) categories if you would like to score Elite Series points for yourself and your club. We are also offering some "Ageless" categories, if you prefer. Note: Age is as of Dec 31st this year. Middle distance: "Ageless" categories for this race. Winning times are expected to be around 30-35 minutes. All races will have a Sport category, suitable for fit adults and teams that are new to orienteering. In the Long and Middle distance races, the Sport category uses the "Scatter" format - which allows you a certain amount of time to visit as many controls as you can. Each control visited earns points, but being late to the finish incurs penalties. Strategy and consistent navigation are rewarded! Your challenge is to collect the most points possible in the time limit (45 minutes for Middle Distance, 90 minutes for Long distance). In the Sprint race the Sport category will be on the Elite course and will use the "Point to Point" format in which all controls must be visited in the specified order, and the challenge is to visit all controls in the least amount of time.. Teams of two or three are welcome and can compete in the Sport or Novice categories. Teams pay one entry fee per member. Teams require just one SportIdent card (see "electronic punching" below). All team members must belong to a recognized provincial association (see Membership" section below). Online Registration - now open!! The all inclusive price includes all three races, the Super Sprint Junior fundraiser, Saturday dinner in Canmore, bus shuttle to start of Canmore Sprint, and even your SI card rental. It offers a significant savings and convenience compared to the a la carte pricing. The a la carte pricing allows you to chose individual items if, for some crazy reason, you won't be taking part in the full weekend of activities. Register before midnight April 13th (Mountain Time) and receive about 10% discount on the adult all-inclusive price. Register after May 16th and pay extra! $25 extra per person. And as a special late-registration bonus you also risk not being able to run in your chosen category if we don't have enough maps printed. So why bother registering today when you can wait and pay more later on? Online registration will close midnight May 23rd (MST). After this on-the-day entry will be available in the Sport and Novice categories only. There will be on-the-day entries available in the Sport and Novice categories. Our agreements with Alberta Parks limits us to 150 participants in the Mt Laurie race. So register early to avoid disappointment if the race sells out. For insurance purposes all participants must be a member of a recognized provincial orienteering association (or national federation) to take part in Barebones. You can purchase an Alberta Orienteering membership online at www.orienteeringAlberta.ca. There are two membership levels: Club & Full. Club members may only compete in the Sport & Novice categories at Barebones. Full members may compete in any category. All events use electronic timing. There is a small charge of $2/event to rent SportIdent cards if you don’t have your own. NOTE: Calgary JDP members can use the SI cards they use on Wednesday evenings - NO SI card rental required. For parents who wish to shadow their children, please note that shadowing is free. Pay race entry fees only if you will be racing yourself. A complainer’s fee of $25 is payable in advance by anyone who thinks they might be whining about the courses, the map, the terrain, the weather, or anything else that will make the organizers wish they'd never bothered organizing this event. Constructive commentary, as usual, is free and welcome. What the heck is myO ? Adrian Z is developing new software that presents information about orienteering events via your mobile device's browser - or of course on you laptop or desktop browser too. The idea is that you no longer need to print event information since it will always be available on your mobile device, and that the information is presented in a more useful and natural way. Barebones 2012 is being used to test the software. For those without mobile devices it will be possible to print the information from myO running on your laptop or desktop. In consultation with Alberta Tourism, Parks, and Recreation this year we have expanded our safety plan and environment impact statement. In particular we have expanded the sections relating to potential encounters with large animals. Part of the updated plan is to present competitors with more safety information, including recommendations for avoiding and dealing with encounters with large animals. Please take time to look over these important issues and discuss them with your family / friends. Review excerpts from our Environmental Impact statement. Orienteering is an outdoor activity that carries a risk of personal injury due to natural and man-made hazards, animal encounters and environmental conditions. Participants are expected to understand the risks of taking part in orienteering competitions and may be asked sign a waiver to this effect. Steep downhill slopes can be dangerous. The fastest and safest way down these steep pitches may not be on the straight, rocky paths. Crossing of one lightly used road near the finish at Lions Park. Runners must take care in all urban environments, especially when crossing roads. To carry a charged cell phone, and have the Adrians number programmed: 403 585 8478. To carry pepper spray or bear bangers or an air horn during the race and to make noise by shouting while running. The FWOC Junior program is organizing a group camp at Bow River Campground, just a few kilometres east of Canmore on the Bow River. If you are interested in joining them, send an email to jdpregistration@orienteeringcalgary.ca for more details. Canmore has a wide variety of hotels and also an Alpine Club hostel. Any of these would be a very convenient spot to stay overnight during Barebones. The 2012 Barebones weekend is a "priority race" for the national HPP, which means that results in the elite category will be closely looked at when the selections for the Canadian national teams are made. This year the World Championships are held in Switzerland in July. The women's team this year will have only Louise Oram (Vancouver) on the team due to a number of injuries and a scheduling conflict with the Junior World Championships which are held in Slovakia also in July. But on the men's side there is going to be exciting competition for the six spots on the team, and at Barebones this year we will see some of the most promising stars fighting it out! Some of the guys to watch out for: Will C. (Edmonton), Damien K (Manitoba), Patrick G (Manitoba), Mike S (Nova Scotia), Erik K (Ottawa), and Jeff T (Ottawa). It is going to be very fast and very fun at Barebones in the Elite class this year! Watch for the HPP runners who will be wearing the HPP Team Canada shirts. Q. I haven't orienteered much (at all) before. What category should I run in? A. If you are new to orienteering and just want a great run in the forest then sign up for the Sport categories - either solo or team. 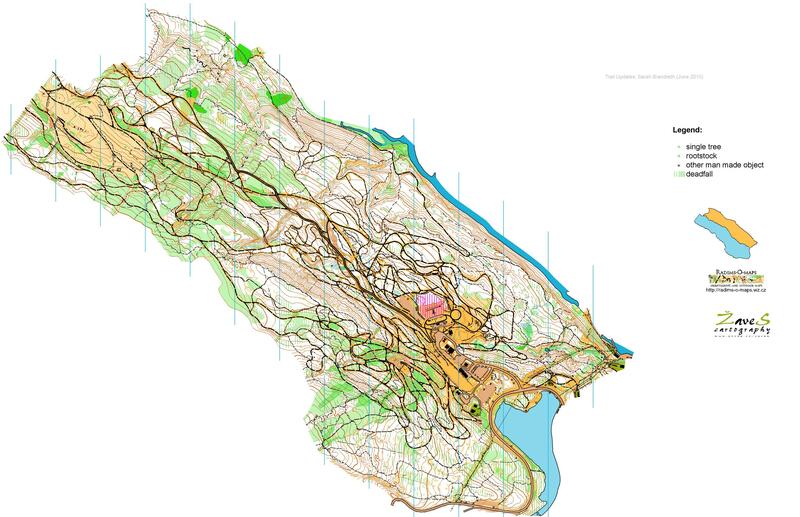 The Sport categories have "Scatter" style course which allows you to visit controls in any order, and to choose which controls to visit, which is generally the most enjoyable format for people new to orienteering. Q. Why is the Sprint a "Canada Cup" race? What is that anyway? A. Canada Cup races are organized to the highest standards, by very experienced officials, and use age-based categories. They give orienteers the experience of high-level event, including assigned start times. They also provide runners in the Elite category a chance to earn points towards the Canada Cup Elite Series in both the individual and club championship. For more information and current Elite Series standings visit the Orienteering Canada website. Q. Where can I buy orienteering equipment? A. Visit O-Store.ca to see their inventory and get all the gear you need online.